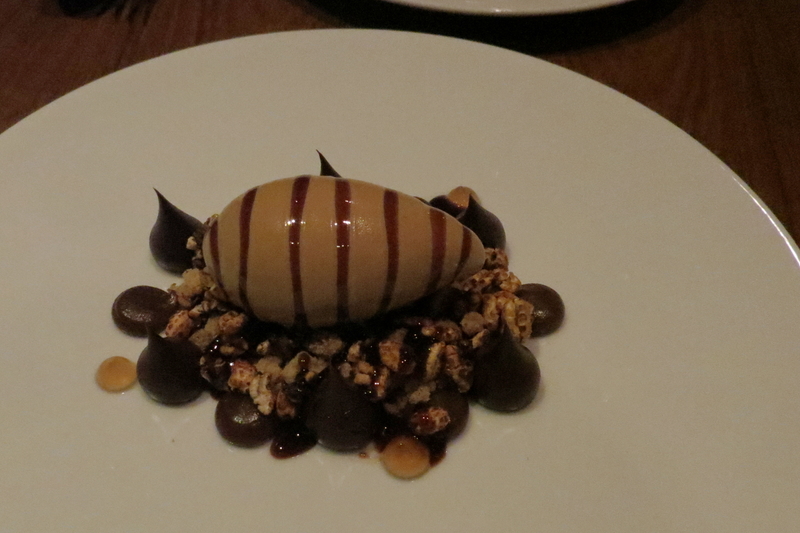 We celebrated our 8th anniversary with a very special treat: dinner at Dinner by Heston (Blumenthal). We’ve been seeing him on Masterchef for years and have always dreamed about eating a chocolate radio at The Fat Duck. His restaurant at Crown Casino here in Melbourne isn’t quite as crazy as the one in the UK, but it was still exceptional and lots of fun. We started with some complimentary crusty bread and salty butter, and drinks. I had a Cider Gimlet (Somerset Cider Brandy, Acidulated Butter, Cider Cordial), which was very cold and very tiny, cider-y with a hit of extra alcohol. Scott had a non-alcoholic Oak Fizz (Oak Shrub, Dry Essence, Vichy Catalan) which he said was ‘arborific’. Of course we had to order the meat fruit. I guess they have moved on from the version that looks like a mandarin. 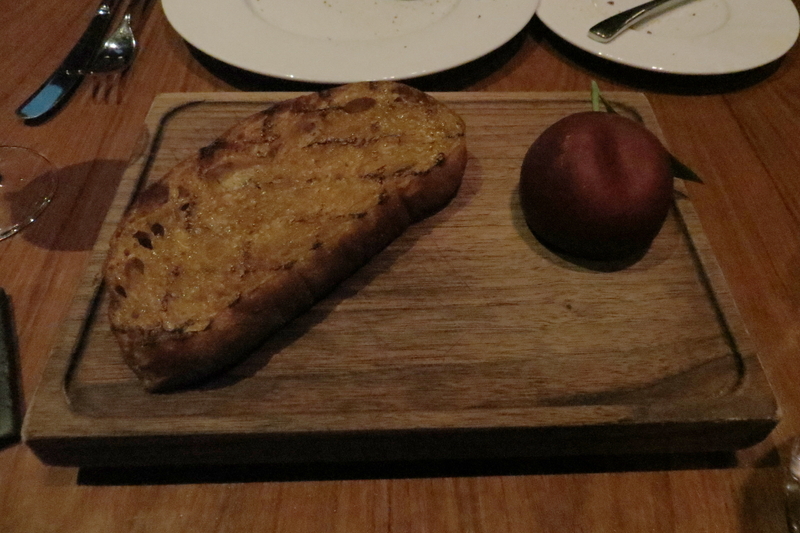 Now you get Plum Meat Fruit (spiced red wine, chicken liver parfait, grilled bread). It was so freaking smooth. And rich. And delicious. The buttery bread was great too, and if you run out, they’ll give you another slice. For my main course I ordered the Cod in Cider, which is actually made with snapper. Everything on the menu is based on really old recipes (like from the middle ages and stuff) but they said that snapper is much nicer than cod now. It had silverbeet leaves, roast onions, fired mussels, and sorrel, in the most delicious buttery sauce. I LOVED IT. It was so so so tasty. 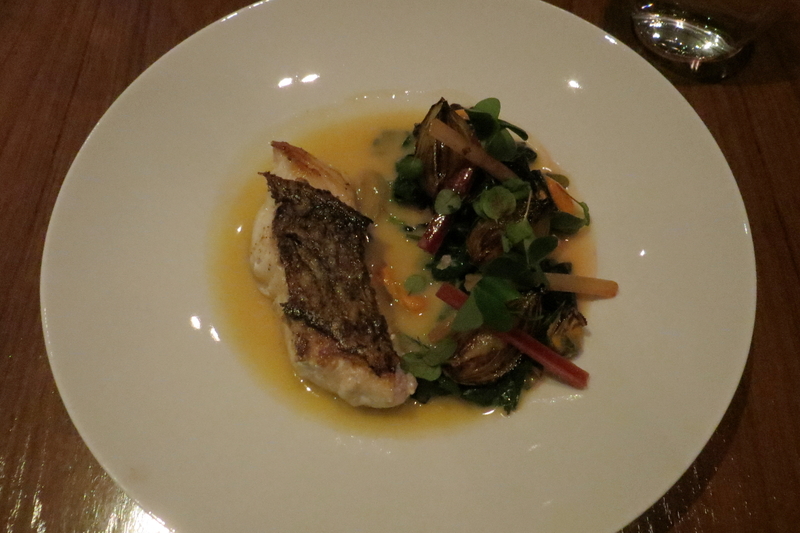 The sauce tasted like buttery ocean, the fish and the mussels were perfect, and the vegetables were just as delicious. 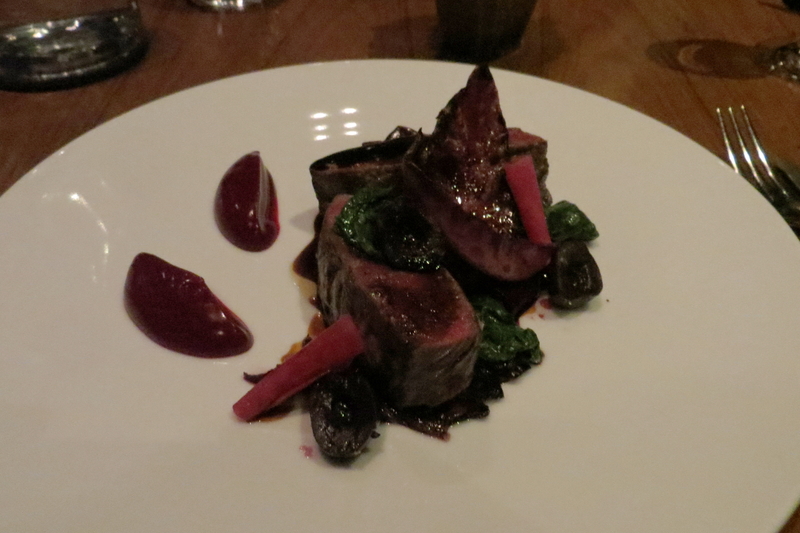 Scott had Venison and Bottled Cherries (smoked beetroot, grilled red cabbage, pickled cherries). Scott says: The venison was perfectly cooked, rare and tender. The smoked beetroot was beautiful and earthy, the cherries tasted like mulled wine and the grilled red cabbage was nicely bitter against the sweetness. 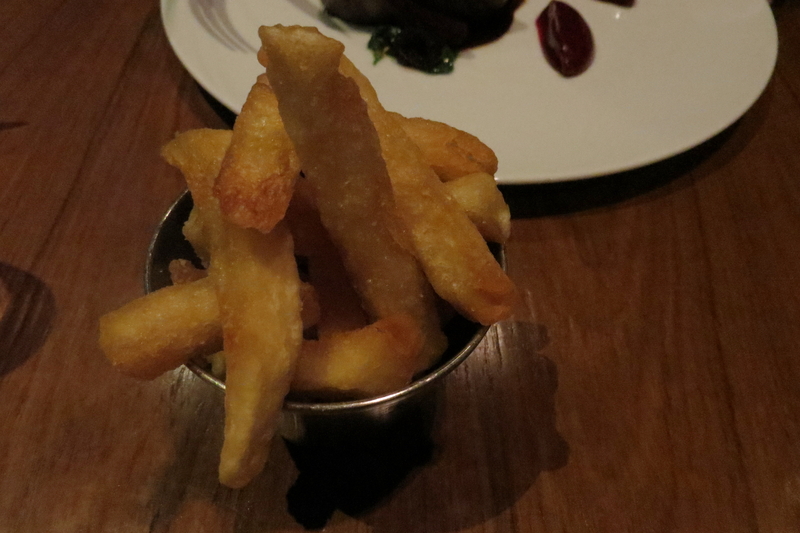 We also ordered a side of Triple Cooked Chips because I’d read about how much other people love them. They really were good chips. So crispy but not too oily. Perfectly seasoned. They tasted AMAZING dipped in the sauce from my fish dish. 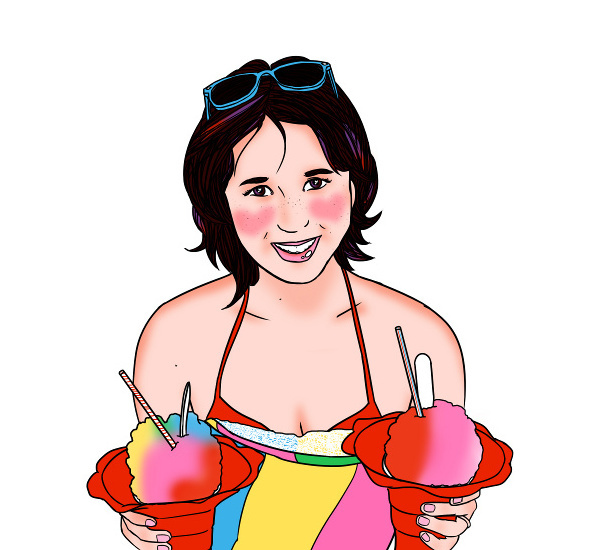 We got the Ice Cream with Vegemite to share. It comes with toasted barley cream, yeast caramel, macadamia, puffed spelt and sourdough crumble. Again, delicious. There were yeasty Vegemite-y bits, sweet bits, tart bits, crunchy elements, and of course everything was super smooth. Really really yum. 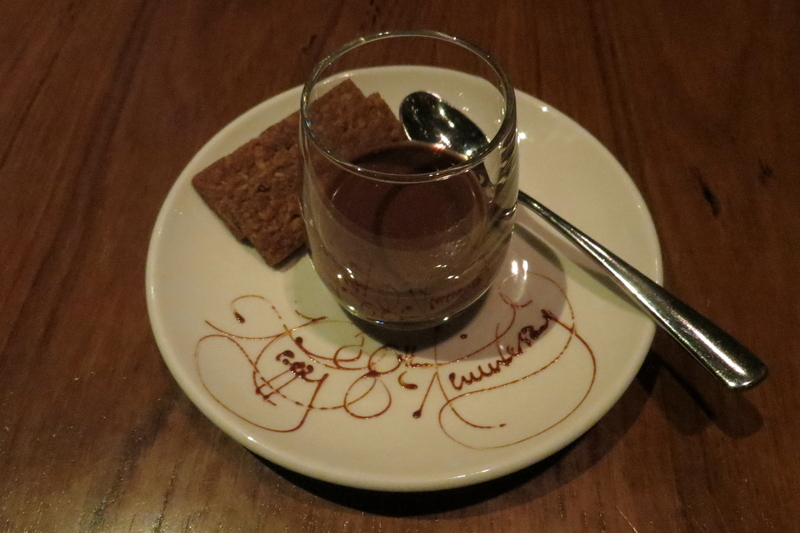 We were both stuffed but then they brought out complimentary chocolate mousse because it was our anniversary. Very sweet of them. It came with yummy little biscuits that you could dip in to the super smooth mousse. It was risky of me to eat chocolate so late at night but I decided it was worth the insomnia, haha. All in all top notch experience. Great food and great service. We were there for about two hours in total. I’m glad we didn’t order any more appetizers or anything because we were both very full after what we had. We weren’t right next to the windows but we could still see the Melbourne skyline and the casino fireballs go off a couple times. Would love to go back any time. I’ll start saving up now.